I loved my trip to Denali National Park! I stayed for several days and did many different things, it was the closest I’ve ever come to having a traditional vacation since I started these park trips, and I loved every minute of it. That’s why, unlike any other park post to date, I’ve split this one into two parts. My trip started with a ride on the famed Alaska Railroad. Trains are such a soothing way to travel. Even commuter rail like Connecticut’s Metro North is good this way. It’s better than sitting in traffic, and sooooo much better than flying. You can just kick back and read, or stare out into space, or work on your blog, or chat with fellow passengers, at complete ease. No unplanned turbulence, no recycled air, no crammed seats, no plummet into the Hudson River (these things can run over cows never mind geese). And the Alaska Railroad ups that ante by having that historic feel in their cars (including a dining car and even a bar car if you want). I wish we had passenger trains like this crisscrossing the entire nation, I’d take them everywhere. 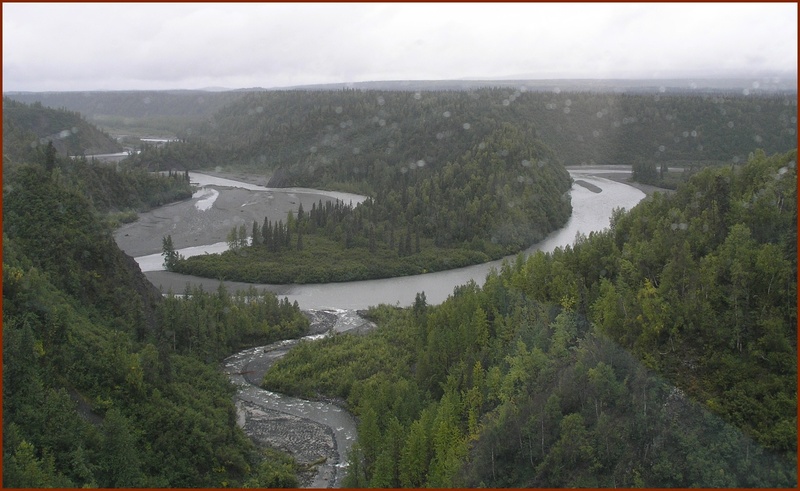 The key to an enjoyable ride on the Alaska Railroad, in fact the key to a fulfilling trip to Alaska in general, is, in my opinion, to bag the cruise packages entirely and book with an Alaska travel “arranger” like Alaska Tour and Travel (the firm I used). These outfits simply collect hotels, transportation, and various tours, events or excursions into packaged itineraries. You can select adventure itineraries or low-impact itineraries or “just give me a hot tub and a bottle of tequila” itineraries. This provides the best of two worlds: it helps you put together a trip that suits your interests without having to make tons of phone calls (or struggling to figure out which cruise line has the party boats vs. the fogey boats), but it also gives you loads of freedom that a full, all-in-one cruise package can’t (or won’t). In the case of the railroad, you end up with a ride on the historic cars. Why is that a big deal? Because all the cruise ship folks are packed into one or two cruise-owned cars (the “Princess Car” or the “Carnival Car” or whatever), and you can’t roam from one to the other! Cruise people are stuck, just like they’re stuck on that boat. I talked with lots of folks on the “freedom” part of that train, everyone from locals to intrepid wilderness backpackers to a family of Germans straining to see a moose (don’t they have moose in Germany?). On the Carnival Car, you’re stuck talking to the same cruisers you’ve been stuck with for the past week. You know, the ones who never shut up at dinner or wear too much perfume all the time or don’t care much for their personal hygiene (“hey, I’m on vacation, why bother bathing”)? Bleagh. Before my trip on the Alaska Railroad, I’ve never ridden on a train outside of the Metro North or various city subway systems, and there is no comparison. The Metro North rails are lined with trash and abandonment, the subways are lined with urban decay or tunnel darkness. 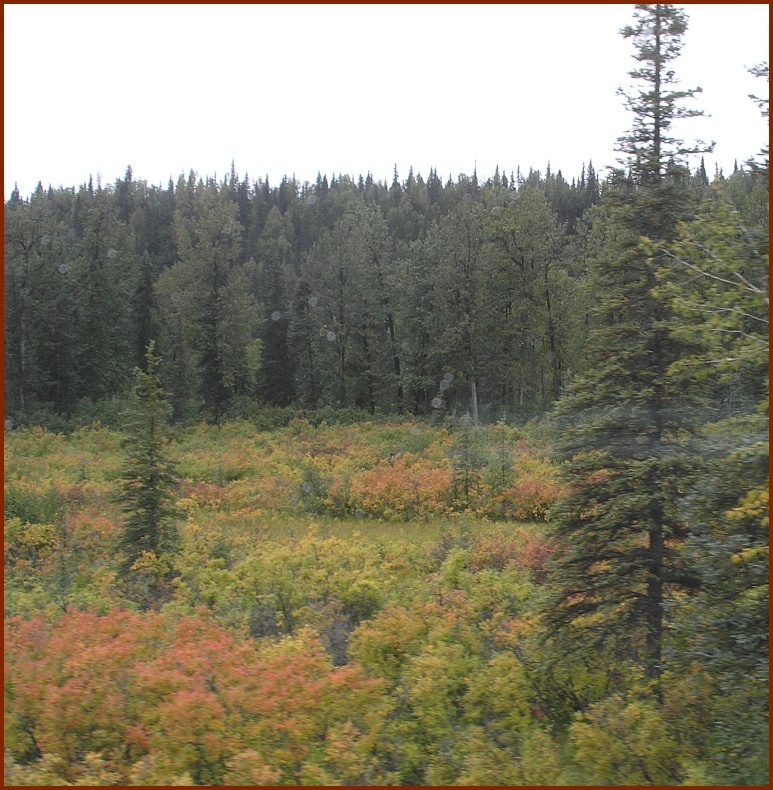 The Alaska Railroad is lined with gorgeous scenery. The Alaska countryside is so beautiful, so interesting, you can look out the windows for hours and hours and never get bored. Even more appealing, on the day I rode (late August, nearing the end of the season), the railroad was about 1/3 full, if that. I sat in the upper viewing booth (the one with the sign saying “30 minute limit”), by myself at times, at other times with only a handful of interesting people, for almost the entire trip. That itself was a lot of fun, it’s like watching great previews before the movie at the local multi-megaplex. 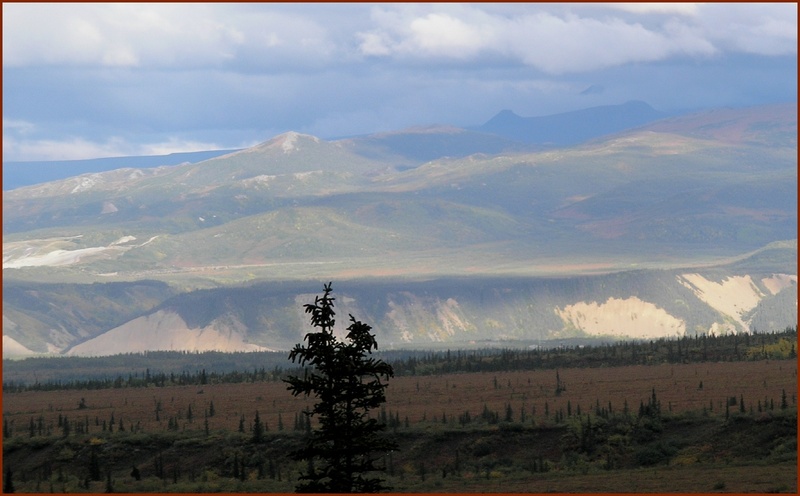 It soooo gets you into the right frame of mind for beautiful Denali Park. I stayed at Denali. No, not in the park. I stayed at the tourist town just outside of Denali that is also called, I guess, Denali (I wonder if Denali is Alaskan for “Smurf”?). Anyway, Denali is literally just that: a tourist town, meaning no one actually resides there. People live there during the tourist season to wait tables or operate the local sub shop or drive the tour buses or clean the hotel rooms or run the river rafting excursions. Tourism is the sole reason the place exists, and when there are no tourists, there is no town. Going at the end of season was actually kind of cool in that aspect. You get the sense that Denali Town is like a big travelling circus or something, by the end of the season everyone who’s been living there for the past 2-3 months not only knows each other really well, they’ve consequently learned how to relax and party (or participate in :ahem: other activities) with each other. They also realize that they will soon be going back to their real lives wherever their real lives are. This gives such a relaxed, carefree, Bohemian vibe to the place (sort of like a Dead concert with a high cost of living). It was even getting close to Denali New Year, a manufactured holiday, complete with midnight countdown, marking the end of the tourist season. Soon the town would be boarded up and evacuated, all the bartenders or shopkeepers or chambermaids going back to Russia or New Orleans or Croatia or Los Angeles or wherever else they really call home. I enjoyed being in Denali Town at the end of season, in fact I liked being in Alaska at the end of season for a lot of reasons. If you go, I recommend you go the last week of August into the first week of September. 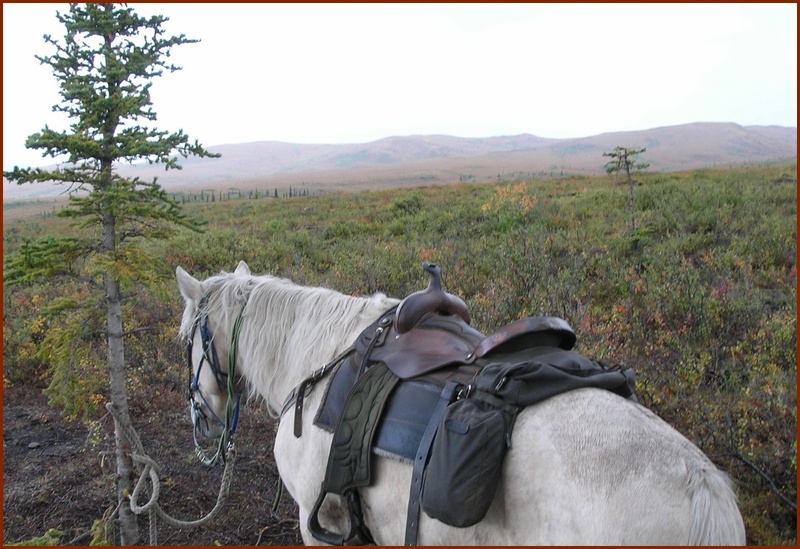 The very afternoon I arrived in Denali Town, I had my first excursion: horseback riding on the tundra. A grizzled local (yes, an actual local, imagine that!) picked up several of us from our hotel and took us to a ranch in nearby Healy. Our guide was a nice chap, a Coloradan ranch hand who worked in Alaska during the season to pick up extra cash. I was joined by five or six other folks, all nice people who actually knew how to act around animals even if they weren’t experienced riders. I’ve ridden horses before, but am still a pretty weak horseman. I do know the cardinal rule of horseback riding: treat the animal with respect and kindness, but don’t be afraid to tell him where you want to go. So many folks are either scared to death, are unwilling to take control, or simply don’t treat the animal right. Horses sense all these things and will act accordingly. I’ve seen people lose complete control of their horse, usually with painful consequences. We were out there for a couple of hours, and right away, I fell in love with the place. Alaska is big and sparsely populated. That means it’s incredibly easy to get out into the wild, away from it all. We only had to go through the gate and cross one small hill to experience what it’s like to actually be out there. No visible roads. No sounds of car engines or gangsta subwoofers. Nothing but birds and wind and the flump flump sound of hoof on tundra. Our guide actually didn’t speak much for the first 20 minutes or so, and that was intentional. You can’t really experience Alaska without experiencing that quiet of remoteness, and he let us soak it up for a time before going into tour guide mode. Once he did turn talkative, we started to learn more of the ins and outs of Alaska life. He explained the two cardinal rules of wildlife encounters (“run from moose, don’t run from bears”). He explained the nature of the tundra (it’s a carpet of tangled root systems laying on top of permafrost). He explained the significance of fireweed (“it turns redder as winter approaches” — it being the end of season we saw several plants with reddish leaf tips). All of it low key, all of it interesting, and, best of all, he was simply a good guy to us and to the animals. None of the arrogance of the typical impatient or bored tour operator, you could tell he liked what he was doing, and liked dealing with people. After a couple of hours, we were back at the ranch, and the local drove us back to Denali Town. He wasn’t too thrilled to hear about the fireweed (they take winter very seriously up there), but he chatted us up with some of the local folklore. 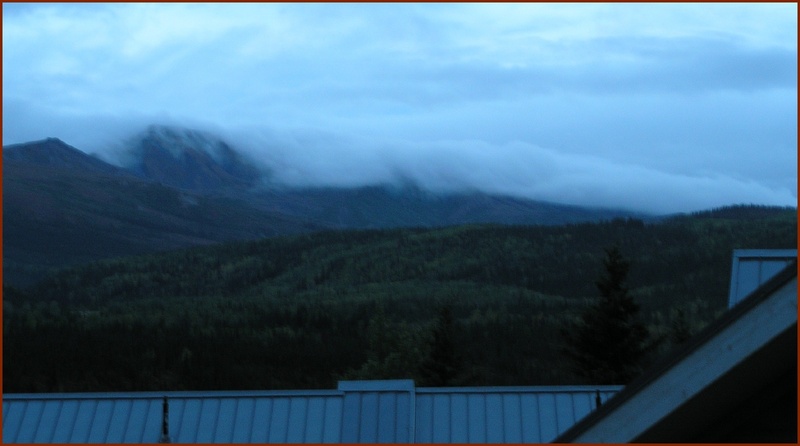 I ended up back at the hotel quite satisfied: I just had my first day at Denali, and so far, it was a great trip. I once saw a show on PBS about the AK RR and thought “I wanna see that” well, this post has me thinking about that again, of course as you know we were thinking of a vacation out there anyway. Of course, now with all this “house” stuff, that might be a bit more problematic huh? Meh, anyway, you should try the Euro-rail sometime. I traveled all over Europe with a pass. GREAT scenery and lots of people met… Even got picked up in Germany…. Many years ago, I started on a personal quest to visit every site in the U.S. National Park System. This is not an easy task, there are almost 400 of them!! The journey has been a fascinating one. I have learned more about the natural world, American history, and the breadth and depth (plus the subtle insanity) of our culture, than I ever thought I could have. On this blog, I’ll share experiences, observations, and insights from my trips. I hope you’ll enjoy your stay here, and I appreciate your comments and feedback!